Alejandro Agag, CEO Formula E, together with Philipp von Hirschheydt, Executive Vice President EMEA from Continental Tyres. 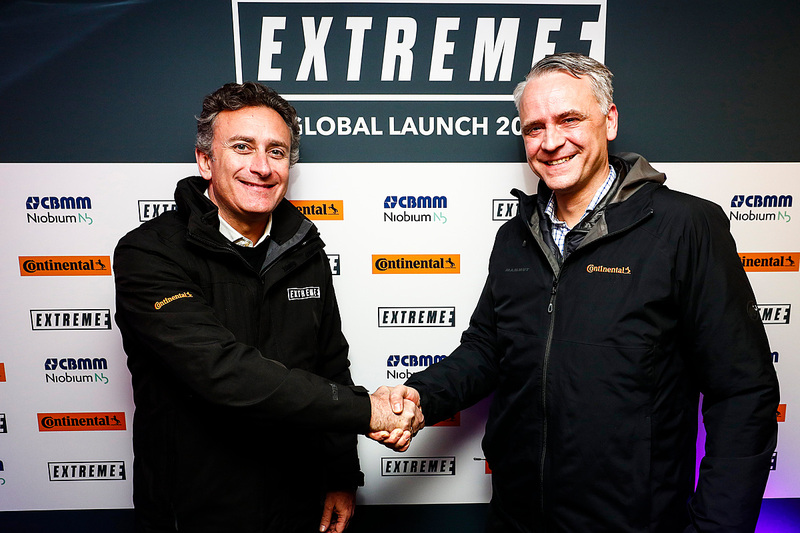 Continental is to sponsor the Extreme E off-road electric racing series. With sustainable electric SUVs and tyre technology from Continental, the new series takes participants to the most remote corners of the world. Extreme E organisers are anticipating twelve teams taking part in the inaugural season, slated to begin in exactly two years. Prototype testing is scheduled to start in April 2019 and Continental is initially a Founding Partner of Extreme E, becoming a Premium Partner in 2021. The tyre manufacturer will ensure perfect road grip, whether in the Himalayas, on the coast of the Indian Ocean, in the Arctic, across the desert or in the tropics. The racing series at its locations will emphasise the challenges with which everyone in these ecosystems is already being confronted by today. Nikolai Setzer, Member of the Executive Board of Continental and Head of Tyre Division. “We are truly excited to partner with Extreme E.” said Nikolai Setzer, member of the Executive Board of Continental AG responsible for the Tire division and Corporate Purchasing. “This very new format of racing sports offers the opportunity to demonstrate how our ultra-high performance tyres succeed in extreme conditions. Drivers in this adventurous off-road series will experience how performance meets safety, no matter which ground. An important factor of this series will be to heighten the audience awareness towards current and future challenges such as climate change, the responsible interaction with our environment and the protection of important ecosystems. Sustainability is high on our company’s agenda and this aligns perfectly with the targets of Extreme E, too.” The technology company will equip all of the cars in the races with suitable tyres for the respective terrain.